We are Building NewLaw. You are too. We should talk. Peter Aprile, Natalie Worsfold, and Wayne MacPhail (guest host), discuss NewLaw, the reasons that Peter and Natalie started BNL and what listeners can expect in Season 1. Wayne MacPhail is to Building NewLaw as Yoda is to Luke Skywalker. Wayne’s real gig is w8nc inc.’s (pronounced WAIT-AND-SEE), President. Also, he is rabble.ca’s Director of Emerging Media. 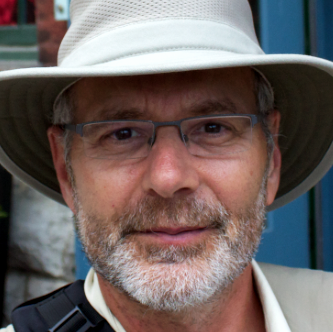 Wayne has been a print journalist and online content creator since the early ’80s. He has created content for most of the major online networks in Canada, he is a published playwright and book author, and has taught online journalism at many Ontario colleges and universities. Peter Aprile: [0:10] Hi, and welcome to Building NewLaw. It’s a podcast hosted by me, Peter Aprile and my colleague, Natalie Worsfold. In each episode we interview lawyers, legal technologists, and other like‑minded people at the forefront of NewLaw. We hope that the podcast connects the NewLaw community and helps us all learn more about the approaches that are changing the way that we practice law. Sponsor: [0:33] The Building NewLaw Podcast is supported by Counter Tax Lawyers, a new type of tax controversy and litigation law firm. To learn more about Counter, go to countertax.ca. Wayne MacPhail: [0:50] Hi, this is a brand new podcast. We’re here with Peter and Natalie. Peter and Natalie, who are you guys? Natalie Worsfold: [0:55] Hi, I’m Natalie. I’m a tax lawyer. I work with Peter at Counter Tax Lawyers. Peter: [0:59] I’m Peter Aprile. I’m a tax lawyer, as well. As Natalie said, we’re part of Counter Tax Lawyers, a tax dispute and litigation boutique that helps small and medium sized business in tax disputes with the Canada Revenue Agency. Wayne: [1:13] I’m Wayne MacPhail. I’m here to help you kick off the first podcast in the new series. Let’s start off by defining NewLaw. What is NewLaw, Natalie? Natalie: [1:22] I don’t think NewLaw’s a new term. There’s a variety of different definitions. When I look at NewLaw, I basically look at it as the next generation of law. Movement or willingness to change the practice and the profession of law. Peter: [1:35] I think that’s right. I think it’s any process or procedure or application that changes the way that we deliver services or that clients receive them. Wayne: [1:44] If we’re talking about change or we’re talking about new, it suggests that there’s something wrong with old law or big law. Let’s talk a little bit about that. What’s wrong with the way that the legal profession is going now? Peter: [1:58] I guess it depends who you ask, but I think, generally speaking, what has been wrong is somehow law has avoided a client‑centric approach to the delivery of services. I think what NewLaw represents is a rebalancing of that, or a correction to that. [2:16] It’s looking at how people want to deliver legal services as well as how people want to receive legal services. That’s a very different thing than what’s been happening in the past, where it’s been more of a unilateral or top‑down approach. Natalie: [2:29] I came out of law school. I looked at the legal profession, the legal industry. It looked boring. It looked very hierarchical, very top‑down. I didn’t see much of an opportunity for creativity and for bringing tech into law and things like that. [2:45] Certainly, as my experience in law and my practice has evolved, particularly working with Peter, I’ve realized you can do anything you want in law. Wayne: [3:01] Give me an example of some practices here in Canada or elsewhere that are actually doing what you call NewLaw. I really need to get my head around what it is you mean when you say, "NewLaw." Peter: [3:11] Some of the ones that have been popular, especially in Canada, in terms of promoting this and gaining publicity for it has certainly been Cognition, Conduit Law on the higher level, Axiom is another one, obviously. [3:23] There’s a lot of different examples of law firms and people doing interesting things, and either adopting this banner or having this banner thrust upon them. Wayne: [3:31] Give me a concrete example of what they’re doing that makes you think, "Yeah, this is new. This is different. This isn’t the same old, same old. This is a disruptive innovation." Natalie: [3:40] Something caught my eye recently. I saw that Gowlings had just launched Gowlings Practical, which is a project management tool that’s based off of the Cael system. I thought that that was really interesting. They’re focusing on having a client involved in terms of the planning, the management, and the delivery of the services. [3:58] Another thing that I saw that was, I thought, fascinating is ClauseHound. Basically, they’re building a clause bank of precedents that you can use to help you draft documents quicker. Wayne: [4:10] Is NewLaw just about software innovation or is there anything else to it? Natalie: [4:15] I think there’s plenty more to it. Certainly, the software side of it’s very interesting, but there’s been a difference in how law firms are being structured, how people are accessing law firms. [4:24] Law firms are typically seen as hierarchical. I think what’s happening generally in the composition of law firms is there are less lawyers. We’re seeing people with a math background or statistical analysis is creeping in there. I think it’s becoming much less of a lawyer‑driven profession. Wayne: [4:37] What are you hoping people are going to get out of listening to this podcast? Peter: [4:42] First of all, we are hoping that it connects to community. We often discuss about how what we’re doing is different, and how there must be a whole host of other people that are out there doing things that are different as well, that we don’t know or don’t have access to, or aren’t promoting it in any way. [4:55] I guess connecting everyone is one of the goals and one of the things that we’re hoping people get out of it. [5:00] The other thing, I would say, is the creativity that’s going to come with it. We talked about NewLaw not being a new term, but I think the shifting mindset or the degree to which mindsets are being changed in our industry is significant and is happening rapidly right now. [5:17] Anything that we can do in this podcast to share different ideas, share people who have shifted their mindset and are doing something very practical with it to help other people find their path or promote change as well, is certainly a secondary goal here. Wayne: [5:31] I wanted to pick up on this idea of the shift. Is the shift towards NewLaw partially because lawyers are feeling that they’re getting disintermediated by technology? What’s the impetus here? Peter: [5:46] I think there’s two things. I think that us, as lawyers, providing legal services. I think that there’s been a frustration for a long period of time of how we were "required" to provide legal services. I think that’s one aspect of it. [5:59] I think the other is from the client side. People don’t like how legal services have been delivered. To some extent, they’re requiring or demanding a change. I think that there’s pressure from both sides. Wayne: [6:12] I get the sense, in terms of this podcast, that you guys, you’re talking about the community. You guys want to talk to these folks, right? Natalie: [6:18] Yeah, I think that’s a lot of it. There’s not a lot of people who are out there promoting what they’re doing. We’ve been digging around and we’ve found some things. I think it would be amazing to have the opportunity to speak to people and to share those experiences. Peter: [6:30] The truth of the matter is Natalie and I are very selfish people. We enjoy what we’re doing. We really like it. We know that there’s a whole host of other people doing amazing things out there that we haven’t even thought of or taken note of. [6:39] Using this podcast as an opportunity to speak to those people and have them share their experiences with us and other people in our circumstance, that’s where we’re trying to go with it. Wayne: [6:47] Who do you think’s going to listen, apart from your mother, Peter? Peter: [6:50] Yes, my mother will definitely listen. Natalie: [laughs] [6:52] I think it’s anybody with a natural curiosity or an interest in learning more. I think it’s an opportunity for us to ask the questions that everybody is asking themselves anyway. [7:03] I went to the Law Society’s Small and Solo Conference. Everybody’s asking these questions. It’s just a case of finding people who can answer and speak with experience about them. Peter: [7:13] I think it’s anybody with skin in the game, anybody who’s interested in it, from one way or another, either client side or provider side. We were reading an article the other day about a GC in the states who is looking how to measure law firm efficacy. I think that anybody who is receiving or delivering legal services, hopefully, will be interested in listening here. Wayne: [7:32] Who’s going to be on the show? Natalie: [7:33] We’ve got a number of people who have lined up. I can certainly tell you some people who I’d love to speak to. There’s a gentleman we discovered just down the road from us, actually. He’s using Watson to create a law student or a legal service, shall we say. I think he’d be fascinating to chat to. Peter: [7:46] Some of the people who are at the heads of these businesses, certainly the guys from Cognition, as well as some of the commentators in this space, as well. Jordan Furlong, Richard Susskind. I don’t know if we can access him, but we’ll sure as hell try. Basically, anybody we see or contacts us with an interest or an interesting story that we think can benefit the community at large. Wayne: [8:10] The podcast is sort of like a NewLaw campfire that everybody can tell stories around, right? Natalie: [8:15] That’s a great way to describe it. Wayne: [8:17] If people want to know more about the show as it’s rolling out, how do they get in touch with you? Natalie: [8:21] We have a website, buildingnewlaw.ca. You can email us at info@buildingnewlaw.ca. You can also find us on Twitter. 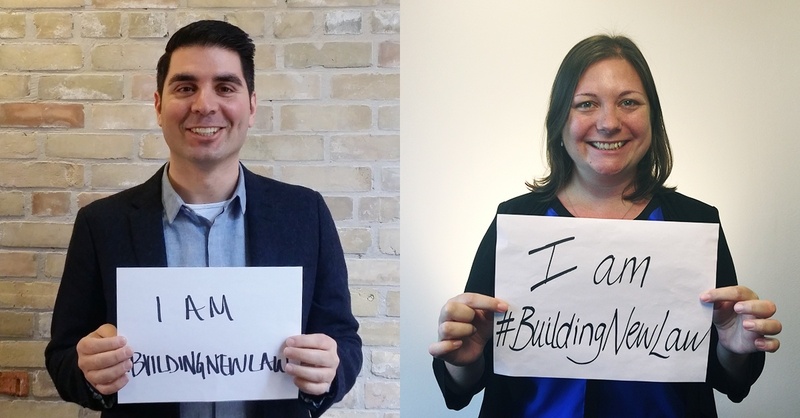 We are @BuildingNewLaw. If you search LinkedIn for Building NewLaw you can find us that way. Wayne: [8:34] Excellent. Peter and Natalie, the host microphone is yours from now on. Good luck with your show. Thanks. Natalie: [8:45] For this episode’s show notes and transcript, please visit our website at buildingnewlaw.ca. [8:51] We’d love to hear from you. If you have any feedback feel free to send us an email to info@buildingnewlaw.ca or come and find us on Twitter @BuildingNewLaw. Don’t forget to subscribe on iTunes, our website, or wherever else you get your podcasts. [9:05] This has been Building NewLaw. Join us again for another episode exploring the approaches, processes, and tools that are redefining how we practice law. Sponsor: [9:18] Thanks for listening to the Building NewLaw podcast, brought to you by Counter Tax Lawyers. To learn more about Counter, go to countertax.ca.